In this issue, we take you to discover our hometown – sunny Singapore! Find yourself in a garden city like no other, filled with stunning architecture, refreshing greenery and helpful locals. Singapore – Its delicious food, exciting nightlife, brimming retail scene, and burgeoning arts and cultural scene have led it to become one of Asia’s top-hit destinations to visit. With its highly-efficient transport system, getting around the city is only a matter of minutes. Though named as the most expensive city in the world to live in, there are in fact many fun and cheap things to do in Singapore! Discover these local gems below! If you love admiring a city from a bird’s eye view, Singapore has many tall skyscrapers for you to get a good panoramic view from up high. The Pinnacle @ Duxton, one of Singapore’s most iconic residences has 2 sky bridges on the 26th and 50th storey. The 50th storey is open to the public. For a small fee (S$6), you can enjoy a sweeping view of the lively Chinatown and its surroundings. We suggest to come here during the evenings during sunset hours (6:30 pm – 7:30 pm). The temperatures are more pleasant and you will get see the city light up as the sun sets. Other alternatives for a stunning city view include the Marina Bay Sands Skypark (S$23) and the Singapore Flyer (S$33), though the entrance fee is slightly pricer. Entrance fee: $6/pax – for locals, bring your EZ card. Tourists can borrow a Tourist pass from the level 1 counter. You’ve probably seen a dozen images of The Merlion. Half-fish and half-lion, it is one of our national icons. Its body of a fish symbolises Singapore’s humble beginnings as a fishing village, and the head represents Singapore as a lion city, which is what ‘Singapura’ means. Head to the Merlion park overlooking Marina Bay and take photos with it, like what many do with the Tower of Pisa! Not many know this, but there are actually 5 Merlions in Singapore! There is a giant one in Sentosa and another in Mount Faber. How to get there: The Merlion park is located next to The Fullerton Hotel. Take the MRT to Raffles Place (East West Line). Walk along the Battery Road towards Fullerton Road. Nature lovers, you will be psyched to hear that our garden city is filled with not only towering skyscrapers but beautiful green spaces too! On your trip, we suggest heading to MacRitchie Reservoir for a refreshing leisure hike through lush greenery. The highlight of the trail is the TreeTop Walk. Nestled in the middle of the reservoir is a 250 metre free-standing suspension bridge hanging 25 metres above the forest floor. 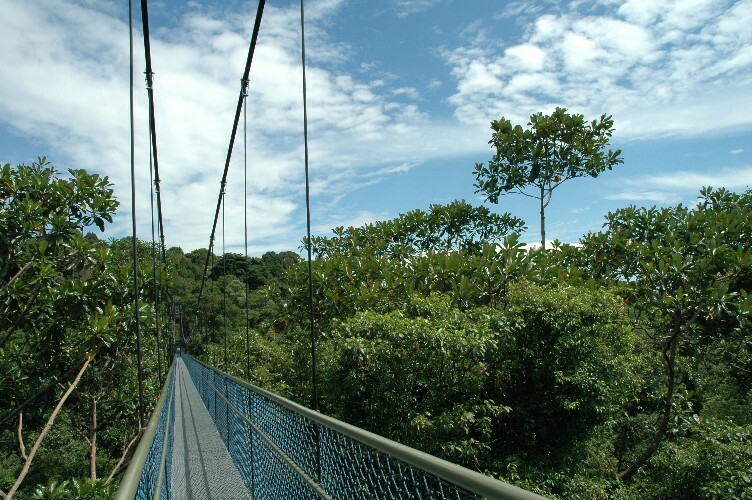 Crossing the suspension bridge makes quite an experience, and you get a scenic view of the forest canopy below. Admission is free! You can reach the TreeTop either via MacRitchie Reservoir Park which will take you about 1.5-2 hours, or the car park at Venus Drive, which will take you about 1 hour. Click here for the e-guide. Alternatives to the Treetop Walk include Henderson Waves and the Siloso Beach bridge. Henderson Waves is a 36-metre pedestrian bridge that connects Mount Faber Park to Telok Blangah Hill Park, and at Siloso Beach there is a ‘floating’ suspension bridge that connects the beach to the Palawan twin towers. Climb up the towers for a blissful view of the sea! Opening hours: Open Tues – Fridays 9 am – 5 pm; Sat – Sunday: 8:30 am – 5 pm. Closed on Mondays. By Car: Park at the public car park at Venus Drive that is located beside the start of the trail. By Bus: Take bus number 52, 132, 163, 166, 167, 855 and 980 and alight just outside ESSO station before the junction of Venus Drive, Upper Thomson Road, and Sin Ming Avenue. Singapore is a melting pot of cultures and cuisines. Well-known to be a food haven, Singapore has 38 restaurants listed in the Michelin Guide 2017, composing of fine-dining restaurants and humble hawkers. Only in Singapore will you find Michelin meals for under S$10! Head to Hill Street Tai Hwa Pork Noodle which has been awarded 1 Michelin star for their tasty bak chor mee (minced pork noodles). Tuck into a bowl (S$6 – 10) of springy noodles mixed with minced meat, pork liver, fried fish, and dumpling all tossed together in a black vinegar sauce. Delightful and delicious, it makes the winding queues pretty worth it. Another hawker star to try is Liao Fan Hong Kong Soya Sauce Chicken Rice and Noodle. Chef Chan’s soya sauce chicken rice and noodle have gotten himself a 1 Michelin star and the title of the cheapest Michelin meal on the planet. After a long (and hot) day of exploring Singapore, a refreshing beer is the best way to unwind. Many say partying in Singapore is expensive, and while that may be true, we do know of some secret spots with cheap drinks to share with you! Five Tapas Bar is one of our favourite hangouts, and it is located in the heart of Orchard Road (Cuppage Terrace), where the vibes are strong and crowd energetic! Five Tapas Bar serves half-pint beers, house pours, spirits, wine, and choya shots for just S$5 each, all day and night long! They have a long list of snacks going at just $5 each too – my favourite is the garlic cockles, which comes in a generous serving. The row of Peranakan shophouses where Five Tapas Bar is located also has many other bars and pubs for you to visit. Five Tapas Bar also has other outlets here. Martini lovers, head to No.5 Emerald Hill just around the corner – they serve 1-for-1 martinis (S$20 – 25) all night long. Another one of our favourite spots is SQUE at Clarke Quay – they have a wide selection of beers (happy hour features 1-for-1 beers), and their truffle-dipped fries are absolutely scrumptious! We hope you enjoyed our Singapore Travel Guide featuring the cheap and fun things to do in Singapore! I’ve pinned all the above-mentioned locations on the map below for your easy reference. Enjoy!